Tonight’s episode of Aangan covered Azhar’s release, Jamil and Alia’s track and the change in Chammi’s character. All the characters in this drama can be termed as lost souls. There is barely any happiness in anyone’s life and even when there are some happy moments, they are usually spoiled by the attitude of one or few of the characters. Azhar’s release tonight was one such moment. Even before Azhar’s arrival, Jamil’s complete lack of interest showed that his father’s presence made absolutely no difference in his life. The second Azhar entered, his wife started sharing the problems she had been facing, Chammi made matters worse and Azhar and Alia were the only two people who actually shared a special moment in this scene. The relationship between all these characters is more bitter than it is pleasant. Azhar was never there for his family which is why his children resent him and his wife rightly blames him for not settling his priorities straight. With the exception of Alia, all the other characters do not have a definite connection with each other. Jamil’s character has definitely grown in these two weeks but his ‘lust’ for Alia remains the same. The hugging scene made me wonder why HUM’s censorship policy is so lenient when it comes to this drama! This scene could easily have been avoided. Chammi is another character which is following Alia’s footsteps. While she waited for Manzoor and thinks he loves her, she also laughed mockingly when Alia told her that she loved her. So Chammi too has lost her faith in love after Jamil ‘bhaiya’ betrayed her. Chammi has never been loved by anyone at all therefore she has stopped trying to make people fall in love with her whether it is Alia, Najma, Jamil or Baray Chacha – she just couldn’t care less. That is why she is constantly seen doing things to provoke others. It is however really strange that Jamil and Chammi didn’t have a single scene together in this episode either. Alia once again was reminded of how she should not be falling in love every time she had those feelings for Jamil. Jamil’s scene with his mother after Shakeel ran away also suggested that he had changed. Israr’s scenes are beyond repetitive since he is constantly shown asking for food while Bua tells him off. There is nothing new about these interactions which shows the lack of creativity. There are times when you feel like there are too many characters in this drama and not all of them add something tangible to the story. Tonight Israr got a little more screen time and this time his situation was compared to that of Azhar and Mazhar – all of them are lost souls but Israr definitely has a life way worse than both of them. Azhar’s failure as a family head reflects in every single aspect of his family life. Azhar’s wife finally spoke up today and his reaction was a lot like that of his father’s!! When confronted Muzzafar too never had much to say to his wife. You understand how Jamil’s mother has suffered for all these years but you can’t help but blame her for being such a door mat. For the past few weeks every time Chammi tells Alia off, she is shocked that Chammi doesn’t have more faith in her. Alia always reacts as if Chammi has expressed her true feelings for the first time, even though that is most certainly not the case. 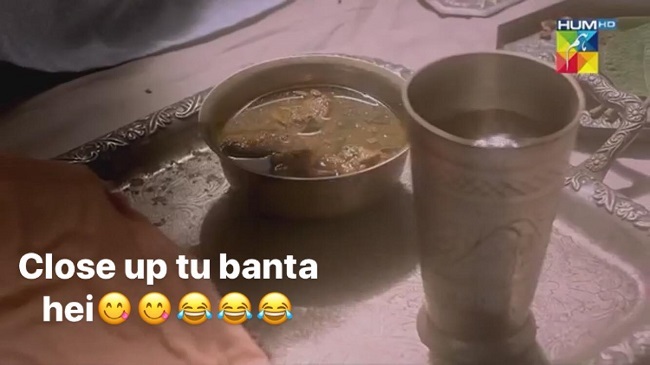 Alia and Chammi’s scene together in which Chammi asks Alia for the duppata was cute – it would have been so much better if these two really were friends. Ahad Raza Mir, Mawra Hocane and Sajal Aly could actually make an interesting trio because their on screen chemistry is superb. Their situations in this drama however are such that there can be no winners in this love triangle. This drama is overcrowded with characters and some of these characters don’t add much to the story. Bua is definitely getting way more screen time than she should have been given. The repetition and the over emphasis on makeovers continues with every passing week but for the first time I am actually waiting to see what turn this love triangle takes.